Run in the Palo Alto Bayland Open Space. 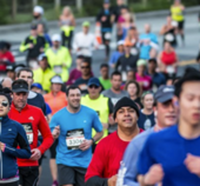 The PALO ALTO 10K, UJENA 5K or the Double 8K Run/Walk (a two-stage road and trail run) (5K+halftime+3K). This is a flat fast course. The 1,940-acre Baylands Preserve is one of the largest tracts of undisturbed marshland remaining in the San Francisco Bay. Miles of multi-use trails provide access to a unique mixture of tidal and fresh water habitats. The preserve has a substantial resident population of birds as well as being a major migratory stopover on the Pacific Flyway. Many consider this area to be one of the best bird watching areas on the west coast. Every participant will recieve a shirt, and bag. Every finisher will receive a medal. Top three in each ten-year age group (19 and under, 20-29, 30-39, 40-49, 50-59, 60-69, 70 plus) will be awarded a special Double 8K performance medal. First place man, woman will win a trophy. 8k Double Adventure Run - $200 in prize money: $50 for first man and woman, $50 for first master man and woman (40 plus).